The marketing guru Seth Godin wrote a blog post recently in which he claimed that the notion of privacy is an illusion and that we don’t really have any privacy today. He’s argues that people don’t really care about privacy - the only thing they care about is being surprised. I’ve been thinking about this post and it has been bugging me. Yes, I do agree that we have less privacy than we often realize. I know that my bank knows how much I earn, my credit card company knows my spending habits, my doctor knows my health status, my mobile phone company knows where I travel, Facebook knows all my friends [who are on Facebook], and Google knows pretty much everything I’m up to. But that information is compartmentalized. My bank doesn’t know my spending habits. My mobile plan provider doesn’t know what I am searching for online and my insurance company doesn’t know my exact health status. It is important that it remains that way. The triangulation of information is the real danger. If my mortgage company gets access to my health records, that’s bad. If my mobile plan provider got access to my friends, that’s not cool. I accept that my physician knows my health and I accept that my credit card company knows where I shop for clothes. I trust that they will treat my data with confidentiality because their survival as a business depends on that. Whether regulated by law or by market forces, every business has to treat its customers’ data with confidentiality. A doctor who doesn’t keep patients’ privacy confidential, breaks the law and won't be a doctor for much longer. A cell phone company that discloses whom I am calling without a court order breaks the law and has to be punished. It is the triangulation of data that makes me really worried. When a harmless-looking iPhone app starts collecting info from other apps, that’s not a surprise as Seth Godin calls it. That’s a criminal activity. Just as if my doctor started sharing my medical records with my life insurance provider would be. We do care about privacy. There is a different degree of privacy awareness among different demographics, likely depending on their culture, education, and other factors. 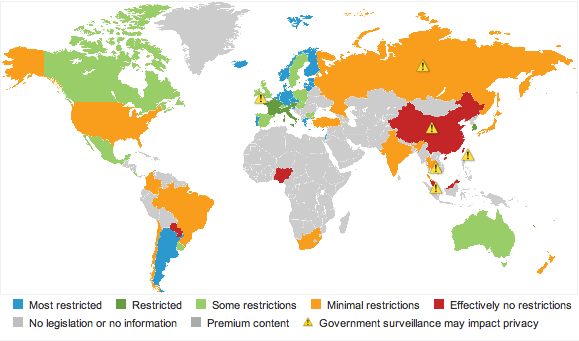 Forrester Research recently published a global heat map on Privacy and Data Protection by Country which clearly shows that the US is below-par compared to many other countries - although still ahead of China and Nigeria. Clearly, some countries take privacy much more seriously than the US. But even in the US, we care about privacy and we want it really bad. Having companies provide me with service and collecting detailed information about certain parts of my life along the way is OK. But swapping that info with other companies is unacceptable. Interesting post. To me it's more about where we draw the line between the freedom (maybe not the best word) technology gives us, and the privacy we give up in exchange. I can chose to download that cool app, but in doing so I risk a little more of my privacy. It is based on personal choice to a degree, but you wonder if folks are thinking through those choices. Thanks for your comment, Rich. Yes, this is the good old trade-off between privacy and convenience. I argue that this is an OK trade-off to make - and everyone has to establish where they are on that scale. The real danger arises when the data is combined (triangulated). It's good that someone is concerned enough about privacy to create a blog. I know for a fact that during background checks your personal information can be gathered from several sources and analyzed continuously for an undisclosed amount of time. Invasion of privacy is about control. The more you know about a person can give you power over them, and the less they know about you makes it very harder for them to resist that power. You can literally control a person's life through invasion of privacy. I believe that's the motivation behind these laws that make it very easy for citizens to have their privacy invaded.